At the corner house on Greenwood Circle there are tiny, terrestrial tokens of extraterrestrial enthusiasts. From the license plate on the car out front, to the collection of movies, Christmas ornaments, and books inside. Ellen DeAngelis has had a fascination with outer space stuff since high school. “I’m more of an ancient astronaut theorist than I am like an Area 51 conspiracy theorist,” she explains. “I’ve kind of convinced him that we should have some,” Ellen says of their backyard chickens. She then convinced Brett they should convert their chickens’ coop to a non-conformist kind. “Maybe it was that clock you got me with the alien beaming up that guy?” recalls Ellen. That inspiration led to quite an eccentric enclosure for their fenced-in farm fowl. “It’s weird, right?” asks Ellen. Weird was what they were going for when they found some old satellite dishes, pressed them together, and covered them in foam and silver paint. They spent every extra moment over the summer, and now they finally have a flying saucer-shaped shelter that is out of this world. The lights that wrap around the middle and illuminate the ramp were a late addition. So now Ellen and Brett spend their evenings enjoying the march to the mother ship and the thought of other worlds just outside their back door. “Maybe it’s more I’m honoring the concept of being visited by others,” says Ellen. 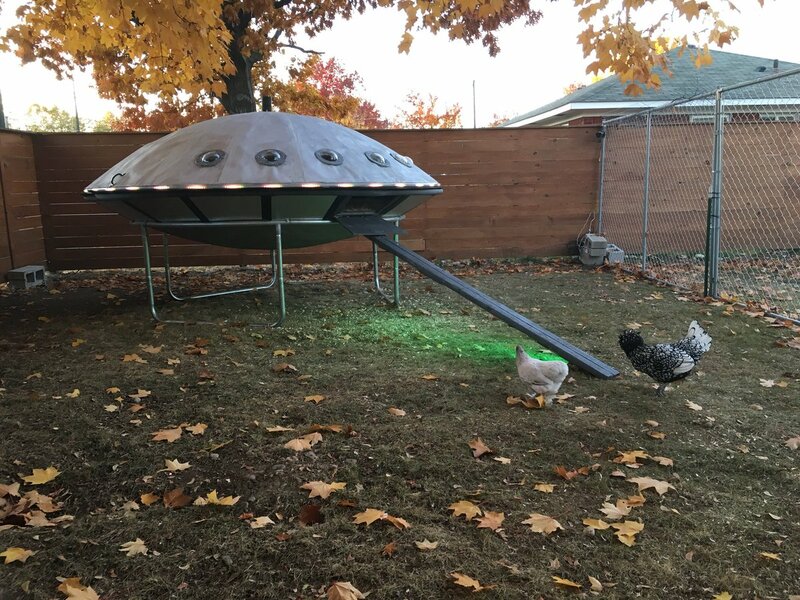 The Boise couple hopes their creation will be good enough to win a contest for best backyard chicken coop. If not, they say it’s still good enough for just them to enjoy every day and maybe inspire some more creative coops.